a teacher could get the class to each bring in a key ring and some keys, and begin the investigation experimentally, first with one key, then two, etc. the simplicity means that students should be able to formulate their own models and put forward clear explanations of why they chose the particular model they did. From what I have said so far, it is clear that I follow the NCTM's Twitter feed, and on that basis you may infer, correctly, that I have an interest in K-12 mathematics teaching. You may even suspect, also correctly as it turns out, that I am a member of NCTM. Indeed, the week before that tweet was published I attended their annual conference in Indianapolis. Not as a math teacher, for I am not qualified to teach mathematics at K-12 level and have no experience doing so; rather as a mathematician interested in K-12 teaching and believing that my knowledge of mathematics may be of assistance to those who do teach in our nation's schools, to those who train them, and to those who provide them with educational materials. ASIDE: Why do I make this disclaimer? Because our society appears to be riddled with individuals who, on the basis of having been taught K-12 math as children, seem to think they know how math should be taught. (In some cases, those individuals freely admit that they were not taught well and never really got it, yet that does not prevent them advocating one method or another, even the one that did not work on them.) In stark contrast, I do not find many people who, on the basis of having flown in an airplane, think they could fly one, or indeed have anything useful to tell a pilot. Nor do I find people who think their experience being treated by a physician makes them qualified to operate on a patient or pontificate on medical practice. the children come to believe that mathematics is ugly, illogical, pointless, and useless. Yup, the outcome is not dramatic, and no one gets killed. But nonetheless tragic, don't you agree? The keyring problem is, as I indicated at the start, a great problem for investigation. There is no single right answer. It all depends on how you interpret the question. As occurs so often with applications of mathematics, you have to start by turning an underspecified question into something precise. With answers ranging from 12 to 3,840 (Any advance on those limits, anyone? ), it is clear that how you introduce the precision can make an enormous difference. 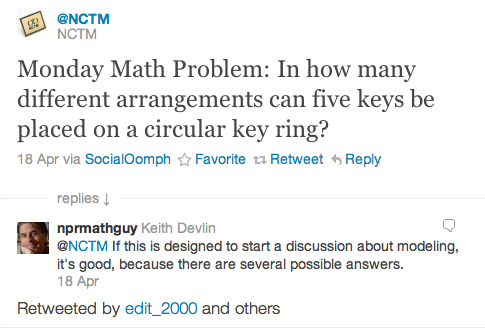 The NCTM tweeter's interpretation of the keyring scenario is an easy one for experienced math teachers to slip into without realizing it, because it is the one that leads to the easiest computation. But as I pointed out (at length, as is my wont) in my May 2010 column, interpreting in simplistic ways problems formulated in real-world terms is tricky and not without significant dangers. Unfortunately, formulating abstract mathematical and logical puzzles in seemingly r eal-world terms (word problems) is a tradition that goes back to the very beginnings of mathematics several thousand years ago, and has been used ever since. As I noted in that earlier essay, this is fine for those of us who enjoy puzzles and learn to interpret the problems in the intended way - to "read the code" - but is problematic for everyone else. And in this case the everyone elses constitute the majority of people! I also have an even larger collection of keys. (Why do we keep old keys, by the way? I have no idea what the majority of them lock, and for sure they no longer fit anything I still have access to.) A very small number of those keys are symmetrical: when I turn them over, they look identical. (Again, is this significant to how we model the problem?) But the vast majority do not have such symmetry. When I modeled the keyring probem, I based my model on my notalgia-based collection of real keyrings and my irrational collection of old keys. In other words, I did what I think any sane, sensible person would do outside the math class: I took the problem at face value, as asking about real keys on real keyrings. I based my solution on what I most commonly saw in my drawer. I then had to decide what constitutes an "arrangement". Again, I interpreted this word (I almost said "key word", but decided that would be too tacky, though puns are their own reword) in the way I thought most natural. The problem asked about different arrangements of keys, not about permuting them around the ring. In particular, if I change the orientation of one of the (asymmetrical keys), I change the arrangement. Again, there is a story to be told, and a decision to make, when symmetrical keys are involved. And I wondered for a while what to do about having two or more identical keys on the same ring, when the mathematical model you choose could depend on why the question was asked in the first place. In the end, I came out with 120 x 32, namely 3,840. A far cry from the NCTM's 12. Which of us is right? Neither. There is no right answer for the problem as posed. It's a modeling task - using mathematics to analyze something we encounter in the world. For sure, I think my answer is more in accord with real keys on real keyrings, and hence more realistic, than the NCTM's. But the value of the problem is that it has so many different answers, and shows that building a mathematical model is a tricky thing. Solving a math problem that arises from a situation in the world can be hard. But nothing like as hard as formulating the issue mathematically in the first place. And as I argued in another earlier column in July 2010, in the U.S., our economic future and our security depend on our excelling at the latter kind of activity. Put frankly, a crucial economic reason why it is important for as many Americans as possible to know how to solve math problems is so they can think mathematically about real world problems. Yes, the keyring puzzle is a great problem, and definitely one that NCTM should be promoting. Devlin's Angle is updated at the beginning of each month. Find more columns here. Follow Keith Devlin on Twitter at @nprmathguy.